While still taking into account each movie’s potential in the money-making department, to compile these five films I looked past just dollar signs and also looked at their potential in terms of award-winning capability, nostalgia, and the huge upside if these films turn out to be great! ‘Captain Marvel’ is the next installment in the Marvel Cinematic Universe and will come out on March 8th of 2019. The film holds a budget of $150 million dollars and will definitely be a spectacle on the screen. Brie Larson stars as lead in the movie and this will mark the first time a female character will play the sole lead in an MCU movie. This is significant as it will be a great test for the untitled ‘Black Widow’ movie and may potentially open a door for Marvel. We were initially aware of the film during the post-credits scene in ‘Infinity War’ which foreshadowed her arrival. The film is said to be an origin story and will take place in the 1990s. Director Quentin Tarantino is back, this time with ‘Once Upon a Time in Hollywood.’ The film is a mystery-crime movie centered around the Manson family murders which occurred in August of 1969. The film is sure to have its own flair and with an incredible cast led by Leonardo DiCaprio, Brad Pitt, and Margot Robbie, this film has enough intrigue already! The film is set for release on July 26th of 2019. The film definitely has award-winning potential as Tarantino has had great past success with almost every single one of his films having been at least nominated for an Academy Award. When this trailer dropped several months ago it sent the internet in a frenzy. This movie has a downside and a massive upside. The film will act as a sequel to Shyamalan’s critically acclaimed films, ‘Unbreakable’ and ‘Split.’ ‘Glass’ has the potential to be Shyamalan’s huge comeback, with an excellent cast this film definitely has award-winning potential if everything is conveyed perfectly. The movie has the capability to be eerily unique and twisted, as well as artistically astounding. If Jackson, Willis, and McAvoy all hit home runs, this could be one for the absolute ages. Disney’s live-action remakes continue in 2019 with ‘The Lion King’ highlighting them all. Some skeptics may doubt the necessity of live-action remakes but with the star-studded cast and the same director that brought us ‘The Jungle Book’ (2016), this film is surely going to be a hit. The trailer garnered record-breaking views for Disney on YouTube and will definitely be a massive hit at the box office next summer. The film is set for release on July 19th, 2019. When ‘Infinity War’ came out it was more than a superhero movie, more than just a blockbuster. It was an experience. Massive amounts of people went to see it, it was the talk of the internet for weeks following and it ended up grossing over $2 billion worldwide, only the fourth movie to do so. ‘Avengers: Endgame’ is set for release April 26th. For starters, the ‘Endgame’ trailer broke the record for being the most viewed trailer on YouTube 24 hours after release with 289 million views. This film will extend that experience and give us the answers we so desperately crave after ‘Infinity War.’ The entire globe plans on seeing this and that is why it is the most anticipated film of 2019! This will be the fourth installment in the ‘Purge’ franchise. However, it will be the first not directed by James DeMonaco although he will still return to write and produce this film. On a budget of just $13 million, Universal Pictures should make a solid profit on this film considering two of the last three ‘Purge’ films have surpassed $100 million at the box office. This prequel action-thriller will be a hit at theaters due to the ‘Purge’ name attached to it. Despite poor reviews from critics, these films continue to obliterate their budgets and draw in crowds that enjoy a good thrill. The sequel to the 2015 film ‘Ant-Man’ will open up in theaters this Friday. Riding the wave of ‘Infinity War’, it should make some rather significant cash. The first film opened to $57 million in July of 2015. It went on to gross over $500 million globally, a little low in terms of Marvel movies but still a good draw considering ‘Ant-Man’ is much lower profile than the other heroes featured in the past few years. ‘Ant-Man and the Wasp’ will draw in the family crowd and the superhero fans, and should go for a win at the July box office. ‘Whitney’ is a documentary about Whitney Houston that premiered at the Cannes Film Festival in May. It will get its theatrical release this Friday. The film will have a limited release, meaning it won’t be released nationwide right away. Instead, it will slowly expand its theater count as most documentaries do. The documentary will feature never before seen footage and rare performances as well as exclusive demo recordings by Whitney Houston. The Dwayne Johnson action/thriller, ‘Skyscraper’ will be released this month and should play out like any usual Dwayne Johnson film. If it follows the course of ‘Rampage,’ which was released earlier this year, it will open around $30 million and go on to gross a good sum at the box office. ‘Hotel Transylvania 3: Summer Vacation’ debuts this month and is the first ‘Transylvania’ film to be released in summertime. This animated feature should do well and with a very conservative budget of $65 million, they will be able to make a strong profit. Both previous films opened to $42.5 and $48.4 million respectively. The third may see a different result due to a summertime release, but I still expect it to be a good draw among families as most wide release animated films are. This A24 studio film received high praise at the Sundance Film Festival earlier this year and is expected to be a big hit among critics when it opens this month. The movie is a coming of age comedy-drama. Early screened critics have this film currently sitting at a 97% on Rotten Tomatoes. This is the sequel to the hit 2008 film ‘Mamma Mia!’ which went on to be the 5th highest grossing film of 2008. It grossed $615 million on a budget of just $52 million. The sequel is expected to follow up with similar success, considering much of the star-studded cast is returning and there haven’t been many true musicals as of late. The musical film fans may be craving something and that would definitely help this sequel. Denzel Washington returns to star in ‘The Equalizer 2,’ an action/thriller. The film should have a good draw among action movie fans and it gets a small jump on the next ‘Mission Impossible’ film, which comes out the following weekend. The first film had a budget of $73 million and went on to gross $192 million globally. This will release in the first weekend following the World Cup which may help out its chances with doing better in foreign markets. This found footage horror/thriller film is a stand-alone sequel to the 2014 film ‘Unfriended’ which went on to gross $64 million dollars on a budget of just $1 million. The movie was filmed secretly last year and had a surprise announcement in March of this year. This will be the sixth film in the ‘Mission: Impossible’ franchise. Tom Cruise continues to defy all odds with some never before seen stunts in this film. The movie will get a good draw from casual movie goers as well as action movie fans. Should ‘Fallout’ do well, expect more ‘Mission: Impossible’ movies to come. This animated film based on the television series is releasing this month. The movie is written by the writers of the show and is directed by series producers, Peter Rida Michail and Aaron Horvath. Warner Bros. will hope that this animated superhero comedy will get a good draw from the family audiences. This film stars Tom Hardy doppelganger Logan-Marshall Green, Betty Gabriel, Benedict Hardie and Simon Maiden. This is a low budget sci-fi feature that is about a man on a path to seek revenge after his life has been flipped upside down. He gets a chip inserted in him that is able to enhance his abilities to do many things. This essentially makes him an upgraded human. Here we have our movie. I found ‘Upgrade’ took a little bit to pick up, but when it did, it truly was a fun ride. The film offers a unique take on futuristic science fiction and opens a world that I truly want to see more of. The film’s acting was mainly good, but dialogue at times was somewhat cheesy. There were times early on in this film where I found things happened a little too conveniently, and dialogue just didn’t go well with the overall flow of the film. The story was sweet and simple, but executed really well, making for an effective movie. The unique camera angles and truly entertaining action sequences are the greatest glow of this film. Fight scenes put me at the edge of my seat, as the choreography and strong camera work elevated them in all the right ways. ‘Upgrade’ had quality build up for the majority of the movie as it was able to wind up the intensity as the film progresses. The payoff for me was one of the weakest spots of the film. ‘Upgrade’ also featured some overall weak antagonists that didn’t add a ton to the story. A stronger antagonist would benefit the movie, but I did not find that this detracted from it much at all. Despite being a low budget film, the visuals and special effects satisfied me. Director Leigh Whannell ensured this film had solid pace and it did flow quite well after a slow start. Sure, it’s not the perfect film, but it is a fun and enjoyable time for sure. The big plus: Superb fight sequences and a pretty simple yet solid premise makes for a really entertaining time. Where it lacks: Poor dialogue and pacing early on may give you a hard time getting into this movie, and when you finally do get into it… the overall payoff lacks impact. I will say that this movie thoroughly entertained me and I hope to see it again. ‘Upgrade’ introduced me to a premise and a world that I would love to see more of in the future. Definitely see this movie if you haven’t as it really is a good alternative to the norm these days. ‘Upgrade’ was cool like I wanted ‘Hotel Artemis’ to be. I truly did have fun with this movie and props to the filmmakers for crafting a good low budget summer film. ‘Day of the Soldado’ is directed by Stefano Sollima (did not direct the first) and is written by Taylor Sheridan who helmed the writing of the first film. Josh Brolin and Benecio Del Toro reprise their roles in the sequel but Emily Blunt does not return. The first film was quite the fulfilling tale, it included a well-told story that was portrayed wonderfully by the actors within the movie. Although the first films finish wasn’t uplifting or happy, it did feel fulfilling. This sequel did surprise me and it’s very clear when watching this film that the story is somewhat abrupt. However, I am thankful for a sequel because Benecio Del Toro really did steal the show in the first film and he truly is such a draw. His character again steals the show in this film despite in my opinion, not being as motivated. The cartel are now smuggling terrorists into the United States and the U.S government has officially put the cartel on the terrorist watch list. This means the DEA have way more jurisdiction and leeway to go in and basically start a war with the cartel. Here we have our movie. This film, in my opinion, is much less layered and motivated than the first. The pace lacks at times. That is very evident in the middle portion of the film, where it begins to transcend into a quite different direction entirely. I do believe Sheridan did the best job possible at writing this sequel, and I am glad Blunt’s character was not part of the story. She did a great job in the first film, but her presence would feel forced in ‘Day of the Soldado’. Props to the filmmakers and Sheridan for not being tacky with this movie. ‘Day of the Soldado’ offers up some good action and some truly brutal sequences. Josh Brolin gets a lot more hands on in this film and he is always fun to watch. This truly is the year of Brolin as he has ‘Infinity War’, ‘Deadpool 2’ and ‘Day of the Soldado’ now out. 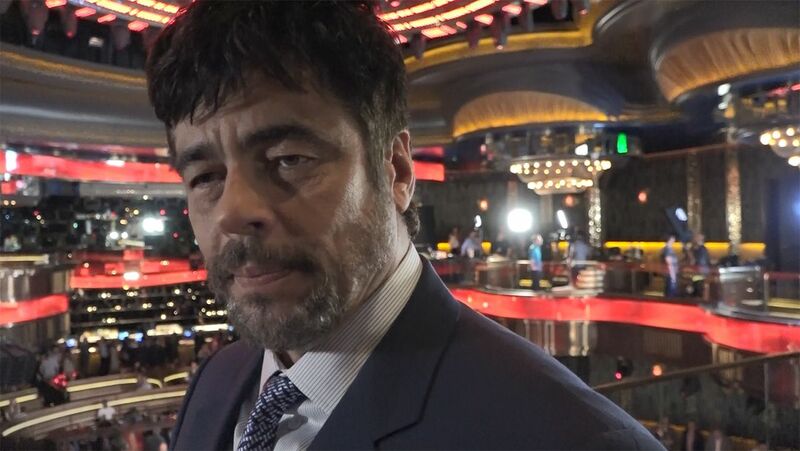 Benecio Del Toro does awesome again as previously stated and although I strongly feel his character motivations were rather blurred in this film, he offers a well enough acting job that it gets pulled off. Well done again, Benecio. The supporting cast does a solid job and younger actress Isabela Moner does a pretty good job in this movie. The other young actor who plays a larger role in this film, Elijah Rodriguez, also does a good job despite again some flaws in his story arc. The score is incredible just like the first film. Many of the same riffs are used in this movie and all around the sounds and music really help to enhance the story and the tension. This movie, just like the first, does a great job at building tension and intensity. ‘Day of the Soldado’ does lose its main drive and waivers from its strongest plot points as the film progresses, and where the first film was a truly realistic take, this one has times that feel far-fetched and a couple sequences that feel out of place. This resulted in a loss of proper pacing and the movie feeling like a stepdown from the first. The big plus: Josh Brolin, Benecio Del Toro, more violence than the first film. Truly has some intense moments that reflect the strengths of the first. Where it lacks: Character motivations that aren’t as compelling as they are in the first film and plot points that are somewhat unfocused make this sequel feel like a stepdown from its predecessor. ‘Sicario: Day of the Soldado’ makes for a solid intense action-thriller with a good enough storyline that it passes on that. The acting is great again and our two main stars are so great in these roles and incredibly compelling to watch. A really great score helps to elevate intense moments but on the flipside the set up and sometimes payoff lacks. ‘Sicario: Day of the Soldado’ and ‘Uncle Drew’ open up this weekend. Initially both these films were projected to open with $10-15 million dollars but early estimates show that ‘Day of the Soldado’ will look for a potential $20 million dollar opening. ‘Jurassic World: Fallen Kingdom’ should win the weekend for a second one in a row but is expected to have a significant drop off from its debut last weekend. ‘Fallen Kingdom’ should garner another $60 million dollars this weekend. ‘Incredibles 2’ will look to pick up another $40 million and hold onto second place. ‘Fallen Kingdom’ is directed by J.A. Bayona and is written by the duo of Colin Trevorrow and Derek Connolly. The island of ‘Isla Nublar’, where ‘Jurassic World’ took place, has a volcano that is just ready to blow. From this, political debate sparks into whether or not the dinosaurs on the island should be rescued. With this we have our movie. I’m a huge fan of the original ‘Jurassic Park’ and enjoyed ‘Jurassic World’ when it hit the big screens a few years ago. Going into this I had my doubts… it’s not uncommon for a ‘Jurassic’ sequel to be a dud. Nonetheless, I was very excited by the prospect of heading into the theaters and seeing a different ‘Jurassic’ film than what I, and millions of others are used to. In that, ‘Fallen Kingdom’ did not disappoint. This is definitely the most ambitious film in the franchise since the original hit the big screen in the summer of 1993. Despite its attempts at being something different, ‘Fallen Kingdom’ often fell flat, failing to deliver a savoring taste of dinosaur, and ‘Jurassic’ magic. The opening third of this film holds some intrigue, aiming to be a deeper meaning than some of the previous franchise sequels. I did not fully buy into Chris Pratt and Bryce Dallas Howards characters going back to the island but the movie gave a solid attempt and it was somewhat believable. Both Pratt and Howard are a thrill to watch and I am glad the series continued on following those two characters. Despite good acting from Pratt, there was no real structural development to his character in the film which feels a tad like lazy writing. We now have two entire films and Pratt has yet to develop whatsoever. Bryce Dallas Howards character, ‘Claire Dearing’ did have a bit of a change of heart in this film and it was pleasant to see her character grow. The aim of truly wanting to make this new trilogy into a world is very clear in this film. I do feel however the movie was not fully focused on that and really danced around its main end-game. I do give ‘Fallen Kingdom’ props for taking some chances and doing different things with the franchise. The supporting cast in this film, namely the two that join Pratt and Howard’s excursion, are rather boring. Justice Smith and Danielle Pineda are the two that star alongside our main duo. At times, both are borderline annoying as they try to convey some unnecessary comedic relief. Other new characters include ‘Eli Mills’ played by Rafe Spall and ‘Sir Benjamin Lockwood’ played by James Cromwell. Cromwell’s character has an intriguing enough backstory, but Rafe Spall’s newly introduced character comes off as two-dimensional and generic. Child actress, Isabella Sermon plays ‘Maisie Lockwood’ aka the granddaughter of ‘Benjamin Lockwood’ in this film and I must say she did quite a good job. Her arc was also probably the most intriguing of the film and it might well be the thing that sticks with me most in the days and weeks following this movie. Jeff Goldblum also reprises his role as ‘Dr. Ian Malcolm’ in this film which is always fun as well. Onto what we are really here for… dinosaurs! ‘Fallen Kingdom’ has some very incredible looking sequences on the island that look great on the big screen. The special effects in this movie are also absolutely top notch and the close up combat with the dinosaurs looks really well done. However, many of the same scenes and gimmicks from previous films were used and I did feel like I was watching a rehashing of other ‘Jurassic’ films at times. So as a truly great action-packed summer blockbuster, this movie does not always deliver. I did have some fun with this movie though and there were undeniably some pretty good, fun sequences. One of the biggest issues with the first film that carries into the second is the villains. The quality of villains in these films need to seriously be upped in quality as they always detract from the film as a whole. Their cartoon-y feel, which is present in both ‘Jurassic World’ and this film ‘Fallen Kingdom’, really don’t do much at all to benefit the story. Michael Giacchino’s score is a positive from this film and he is just continuing to show how much of a terrific composer he is. The big plus: ‘Jurassic World: Fallen Kingdom’ is a solid time at the movies. This film takes the franchise in a different route that some viewers may end up enjoying. The dinosaurs looked great! Where it lacks: Despite taking some jumps, this film didn’t always land, and if you dislike cartoon-y villains and generic side characters… you won’t enjoy the supporting cast of this film. In conclusion, ‘Fallen Kingdom’ is a good action film that has its obvious problems, but you can for sure just relax and enjoy the dinosaurs. Director J.A. Bayona tried new things and I respect that, despite most of them not fully succeeding. The special effects are awesome and although the action sequences may feel familiar, they are still somewhat enjoyable. ‘Fallen Kingdom’ is expected to open up significantly lower than its predecessor, which opened to $208.8 million back in 2015. Due to added competition from ‘Incredibles 2’ and a lesser enthused crowd, ‘Fallen Kingdom’ will look towards an opening between $125-150 million dollars. This is still a great haul which will make it one of this years biggest films. ‘Incredibles 2’ will look to make over $90 million in its second weekend. ‘Fallen Kingdom’ will easily hit the $100 million dollar threshold, but if ‘Incredibles 2’ can do the same, then it will be the first time in history that two movies bring in over $100 million in the same weekend.